Before we let go of winter I want to get in one more post about velvet. It's such a beautiful and decadent texture, let's take one more stroll. You read that right ladies, $22. Buy it now, save for next winter, for everything. This blouse, while absolutely needs a cami would be great for work or play! 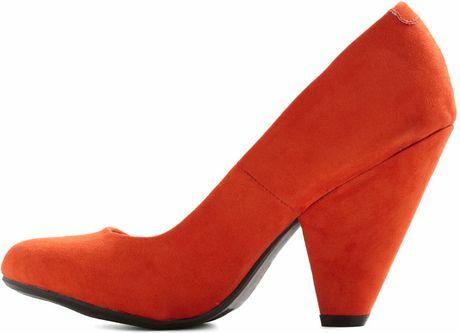 Are these not the most fantastic orange heels you've ever seen? I'm obsessed with the heel. Velvet will always be in style and I just had to get one more taste of it before the warmer weather comes. Wow, what a deal on the Lauren Conrad piece! Looks like I'm stopping by Kohl's soon. I actually have that Motel dress in a long-sleeved, gold version and the velvet is amazing. I wore it out last New Year's Eve and the fact that it was velvet definitely kept me a little bit warmer than normal!